Trained rom an early age ﻿in Ballerina and Jazz, Tahira has a varied and colourful background to draw upon. As a Belly dancer, Tahira has studied with such teachers as Sahra Sa'eeda, Amaya, Elyssa Kariakou, Tamra-Henna and many others. She has also benefitted from workshops from such greats as Fifi Abdo, Aida Nour, Carolina Nericcio (FCBD), and Morocco to name just a few. 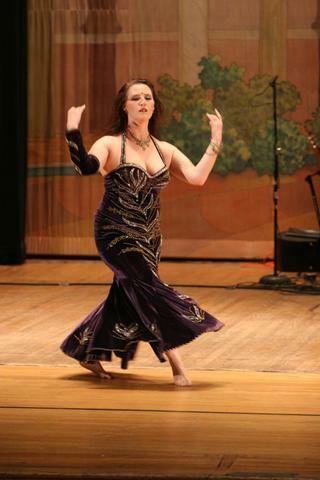 Tahira dances in both the American Cabaret and Egyptian style Belly Dance as well drawing from the dances of Turkey, Lebanon, Yemen and Tunisia. Master of improvisation, she has danced with live musicians such as Yasmine, Shamans Dream and Ragama as well as with many Independent Bands and Singers. Her skills also include veils, zills, sword and cane. She is also perfecting the art of dancing with fire. Tahira has performed throughout Los Angeles at many popular clubs and restaurants as well as many private events. Tahira loves to perform and create personalized programs for her clients. She finds Middle Eastern dance to be beautiful, theatrical and transformative all at the same time. Not to mention fun! She will work with you to create a program especially for you! Contact her for more details! Tahira, aka Nancie Kay Shuman, has been studying and performing dance from the age 3. She is an eclectic personality, having a degree in Theatre and Film and a Master of Arts in Spiritual Psychology as well as a background in business. Tahira is also an Executive Coach, an ordained Minister and a tarot card reader. In what ever capacity she is hired for, Tahira delivers an outstanding show put together especially for you!